I have to confess, for most of my life, I haven’t been Tennis’s biggest fan. Indeed, from the ages of around eight to fifteen, I considered Wimbledon nothing more than an annoying reason for The Simpsons not to be on at 6pm. A Brit was never going to win, so why should I be bothered? Then, Andy Murray came along. For the first few years, I didn’t know much about him. He seemed to be another also-ran, much like Tim Henman had been. I was aware of him making steady progress in major tournaments, only to be knocked out by one of the top three. I caught a couple of hours from Wimbledon 2011 (I think it was Djokovic vs Tsonga, but I can’t be sure), while visiting a friend in Essex. Though I wasn’t particularly invested, I did – for the first time – start to see the beauty of the sport’s simplicity. I really started to pay attention just after The French Open of 2012. I was aware Murray was playing better by now, but also that he had still been knocked out in the quarter-final (partially due to battling back-spasms). Then Wimbledon started, and I was actually looking out for his results. By the time he reached Round Three, I was fully engaged – and what a match! Murray set the record for the latest ever finish at Wimbledon, as he defeated Marcos Baghdatis at 23:02. I was visiting cousins, and we’d had the match on in the background, but had needed to leave before the match finished. I therefore insisted that we had the radio commentary on in the car on the way back, and good job too. Murray fought his way through to his first Wimbledon final, and most of the world knows what happened next. Heartbreak, as the supreme Roger Federer won in four sets. Then came the Olympics, and I was determined to watch as much as I could (and indeed, I did). The tennis was a particular thrill. My family aren’t really interested in it, so it was like having this secret event going on that I could enjoy on my own. Andy was playing with raw determination in the singles, powering past stunned opponents. In the mixed doubles, another star was being born: Laura Robson. It’s a sweet relationship the two of them share, and it’s a bit of shame they won’t/can’t play together more often. 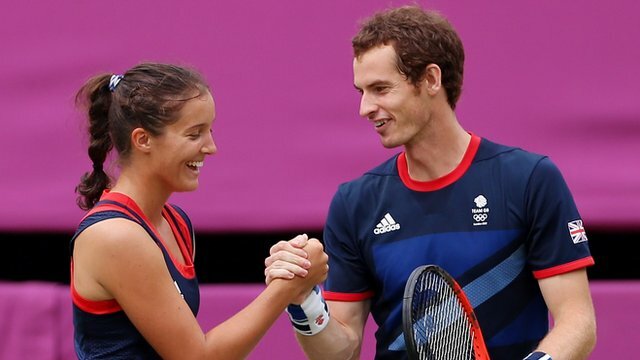 They were seemingly like brother and sister during the Olympics, with Andy looking out for her, helping her improve her game, while Laura was in the family box to cheer him on in the singles final, and hug him during his Pat Cash moment (and her game is improving in giant strides since the Olympics – watch out for her in future majors). I tracked his progress through the US Open – not having Sky it was difficult to watch the matches (though I did watch the semi against Tomas Berdych) – and was delighted when he reached the final. I stayed up to watch it, far later than I expected as it went to five sets, but it was totally worth it. He won, and with a Slam to his name, you could actually see him let go of some of the pressure. When the Australian Open rolled around, I now had eyes on the scores of both Murray and Robson, hoping to see both do well. Laura reached the third round, further than she’d previously gone in Melbourne, so a step forward for her, and Andy reached the final for a replay against Novak Djokovic. While he was defeated, his concession speech after the match showed how far he’d come since the Wimbledon final. He spoke with the words of a man who knew he had more finals ahead of him, and more victories. He may not have won on the day, but he was thinking big picture now. Injury kept him out of the French, but that gave him time to prepare for the grass court season. He won the Aegon Championship at Queen’s (followed by a highly amusing exhibition match with Tim Henman, Jonathan Ross, Michael McIntyre, and more, that’s worth watching on youtube), and then Wimbledon 2013 arrived. The semi-final was almost as tense; Murray went a set down to Jerzy Janowicz, only to fight back to win in four, (despite an argument with the referee about whether or not the roof should be closed, prior to the fourth set). So, Wimbledon final number two, and who else would he meet there but Novak Djokovic? Djokovic, the world #1, versus Murray, the world #2. On paper – and with the bookies – Djokovic was the favourite – but I’m not a betting man, so I don’t care about the odds. I had a feeling that it was Murray’s day. The title of this post will probably have given away whether or not I was right. He won in straight sets, but it felt like five. Both players fought for every point, with many rallies going over twenty strokes – particularly impressive, as it was in 40 degree heat. I was over the moon. The last service game lasted close to twelve minutes, and most of Britain must’ve been on the edge of their carpets (their seats long since abandoned as the tension mounted), eyes fixated on their television and computer screens. At last, after 77 years, a Brit had won the men’s singles at Wimbledon. As I say, that proves nothing, but it amused me that I kept spotting sevens. Also, during the celebrations, I was particularly amused by Alex Salmond, essentially photo-bombing David Cameron with a Saltire. Well, I say flag; I wouldn’t be surprised if it was actually the lining of his jacket. I really can’t believe it’s taken me so long to fall in love with this sport. Maybe it just took the right player; someone who has had to overcome such horror in his childhood, someone who has trained hard, learned well, and has become a shining light for his home town of Dunblane. I don’t know if I’m a Tennis fan now; I suppose I am, but I know I’m definitely a Laura Robson fan, and I’m most definitely an Andy Murray fan. Those two will have my support for the rest of their careers, and, should they ever want one, they’re welcome to have a free ticket to any of my shows! I couldn’t take money from my heroes, as it would be my honour to entertain them, as they have entertained me. I’m so delighted that Andy Murray has ended Britain’s drought at Wimbledon, and I can only hope and assume, that it’ll be the first of many more titles for the sensational Scot.